Cherry Mobile Omega Icon for only Php 6,499! Cherry Mobile, PH's favorite and top selling brand, sets fire in the local arena again as it unveils the new Cherry Mobile Omega Icon. This latest smartphone sports a 13MP rear camera and 5MP front-facing camera both equipped with LED flash that is great for taking pictures and selfie shots. The Omega Icon is stunning and durable since it features a 5-inch HD IPS display with Dragon Trail Glass protection. When you flip it over, leather back design with chrome side accents will greet you at once. This newbie will be powered by Qualcomm Snapdragon 200 processor. All of these for unbelievably low price of Php 6,499. The Omega Icon exceeds expectations for a smartphone of its price. Better grab it now! 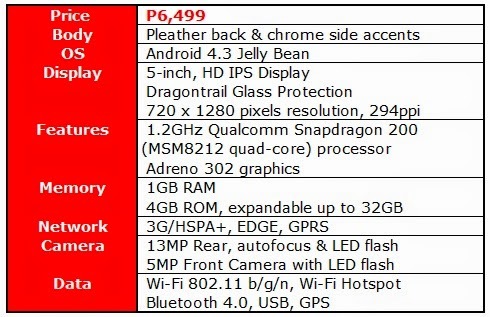 Pinoy Metro Geek: Cherry Mobile Omega Icon for only Php 6,499!